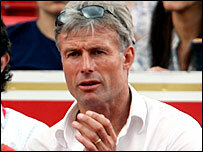 Nigel Sears has been named as Great Britain's Fed Cup captain. Sears will combine the role with his current position as head coach of women's tennis. "We have a lot of hard work to do to get women's tennis delivering at the highest level," said Sears, who succeeds Colin Beecher. His first job will be to pick a team for April's Europe/Africa Zone Group I event when Britain will be among 16 nations competing for promotion. Sears added: "I need to identify those players with the drive and commitment necessary to thrive in a Fed Cup environment and prepare them for April's tie. "The team came close to promotion this year and we will be looking for an even bigger effort from the players in 2007." Success in April's event in Bulgaria will earn Britain a place in the World Group II play-offs in July.